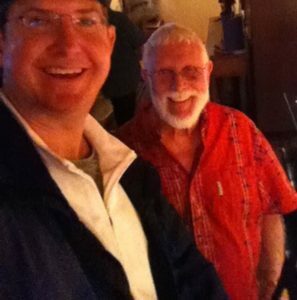 I’ve known Bob Montgomery since I was about 14 when I attended my first summer jazz camp. 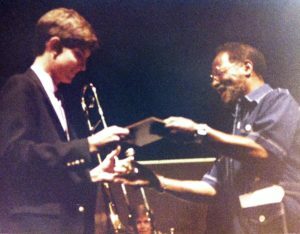 He was the camp director and led numerous camps with Clark Terry, James Moody, Rich Matteson and an all-star faculty band in Emporia KS, Edmond OK, Telluride CO and Boulder CO. Those camps are some of my best learning experiences and fondest memories as an adolescent. 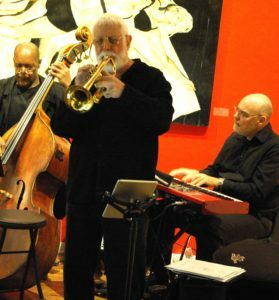 Bob has been a staple in the Denver jazz community as a trumpeter and educator for the past four decades and is always a class act and role model. His work ethic and marketing skills are second to none, and his willingness to embrace technology is certainly commendable and rare for a musician 80 years old. (He even just upgraded to an iPad Pro recently.) Last but not least, Bob always graciously invited me to sit in on his local gigs when I was in high school and college (something I really looked forward to and appreciated), and his continued kind nature prompted him to make sure he gave me this physical photo he found in 2014 while going through some boxes for Clark’s documentary “Keep On, Keepin” On”. Well, Bob is certainly “keepin’ on” himself and we’re all going to celebrate it THIS THURS April 21! Come out and join us!! Nocturne Jazz Club is presenting “Bob Montgomery’s 80th Birthday Jam” on Thursday, April 21 from 7pm to 11pm. 50 of Colorado’s top jazz musicians have been invited to appear during the course of the evening. There will be many of the old guard of our favorite musicians as well as many of the young lions that are new to the Colorado Jazz scene. Nocturne is located at 1330 27th St. (between Larimer and Walnut). You may call 303-295-3333 for information or reservations or visit www.nocturnejazz.com– reservations are highly recommended! Visit www.nocturnejazz.com to check out the club, this is a beautiful room that was built specifically to present jazz by the owners Scott and Nicole Mattson. They make a point of offering great jazz, food and libation.